The present church was built in 1839, in the same place as an almost decayed wooden chapel dating back to the 17th century. The chapel, 11m long and 8m wide, served as a scaffold inside the church during the construction period. The new church could be implemented thanks to gifts and dayworks from the parishioners. The church, built in stone, got the outer surface 33 mx 14M and the tower height 24M. Over the years, the church has been subject to several repairs. The most thorough restoration was carried out in 1961-1962. The outer walls got new putty. A new roof of impregnated pinewood was laid on. The tower was restored in its original condition and received a new stainless steel cross. The gunhouse was given space and height by removing two logs. New benches were inserted. These were fitted with doors in the style of the original benches from 1840. The church's old altar table, which had been abandoned in the 1920s, came back to honor as well as the pulpit from the 16th century. A new altar round was made and the floor of the church's cows and hallways was covered with limestone. Extensive painting work in marble technology was carried out by conservator Evald Håkansson from Sollerön. It is a technique that characterizes the neoclassical style in which the church is built. The church owns two altar cabinets. These marble cupboards were donated by Orsa Church in 1755 when they bought a new altarpiece. The older altar cabinet, which is set up in Sacristian, was made around 1360 and is considered to be from the so-called Ala Master's workshop in Gotland. the larger cabinet, is an East Prussian work from the mid-14th century and is located above the altar. In 1841 the church silver was bought for the new church. Previously, parts of the church silver had come from Orsa church, as did the parish from 1794. The oldest trade fair is from the 17th century. It is made of floral wool and lilac woven fabric with a square patterned cross on the back. In 1963, the church received its third organ. It was built by Lindegrens Organ Buildings in Göteborg and has 14 polls. The organ is carefully intonated and preserves the church's excellent acoustics. In the autumn of 1961 the church was closed for the impending restoration. 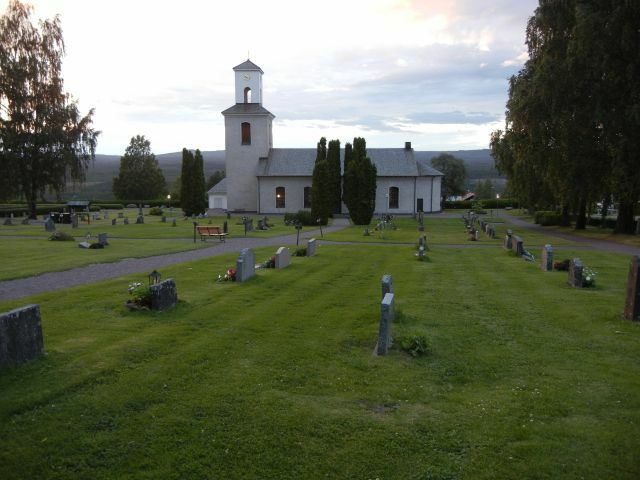 Before this started, the church was loaned to AB Svensk Filmindustri for the recording of scenes from the film "Nattvardsgästerna" with Ingmar Bergman as director. The movie concludes that coral no. 6 in the Swedish psalm book sounds from organ organizer. It is the old Rieger organ, from 1925, which in this way is able to document its tone into the future. The church has two bells. The grandmother's watch is from 1664 and the little clock from 1759. Here the old custom continues to creak for death. At eight o'clock in the morning, after the death, nine strokes of each bell are performed alternately with three strokes each. If a male has died, the grandmother will start the clutch, if a woman has died, initiating the little bell. Then a short summary follows. Many popular corals and spiritual songs have been recorded in Skattungbyn. The most famous coral is found in the Psalm Book (1986) No. 169b: "In Heaven, in Heaven". The evening psalm, "Now has this day," and "The Day of Concection" has three melody variants. " Inscription reads: "Erik Borge Family Grave"
Erik is the son of Erik & Kerstin Andersson and Brother of Anna (Ersdotter) Borg. Wife Kerstin's maiden name is unknown at this time.